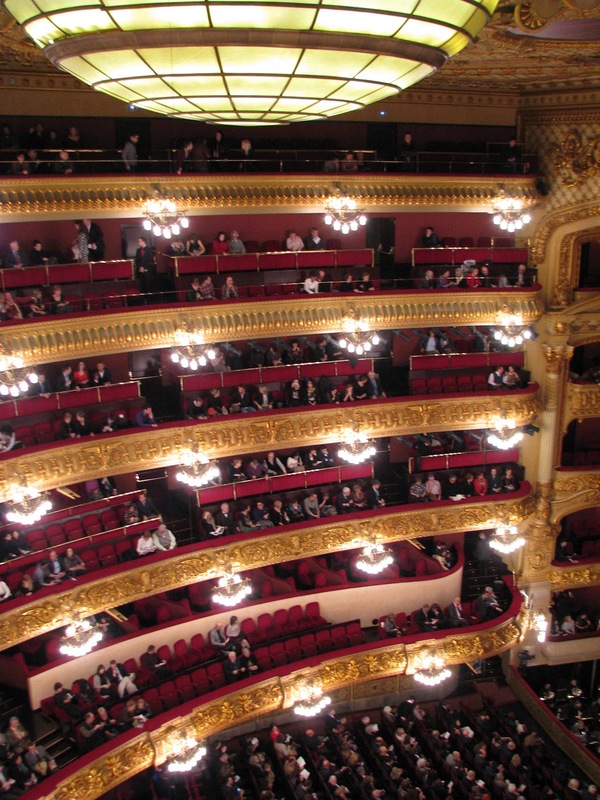 On the evening of Leap Year, my girlfriends and I went to Barcelona's grand old opera house, Gran Teatre del Liceu, to see my favorite opera, La Boheme. 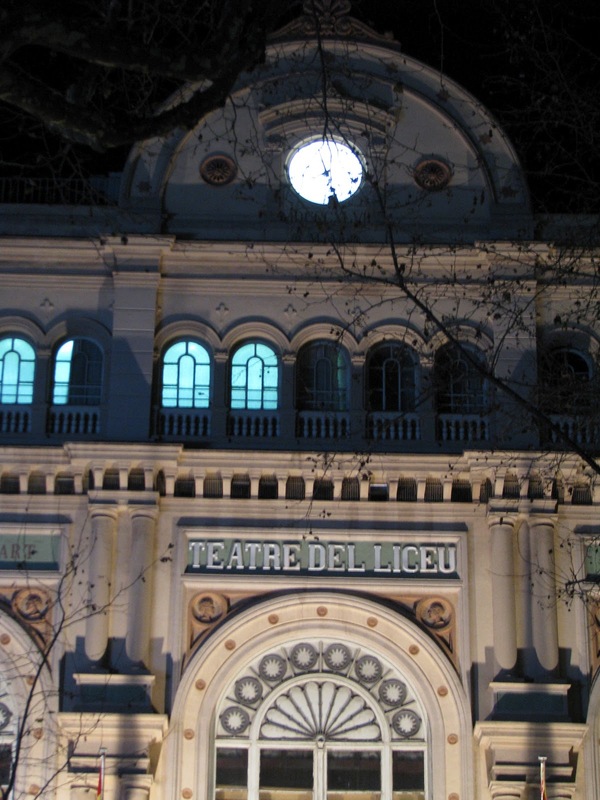 The theatre is situated on La Rambla, a Plane-Tree-lined walking strip through the medieval part of Barcelona- the most talked-about boulevard in the city. We grabbed a light dinner before the show at La Cafe del Opera across the street. 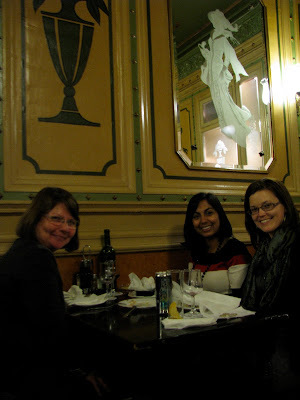 It felt like a Parisian cafe - perhaps the modernisme accoutrements had something to do with that? 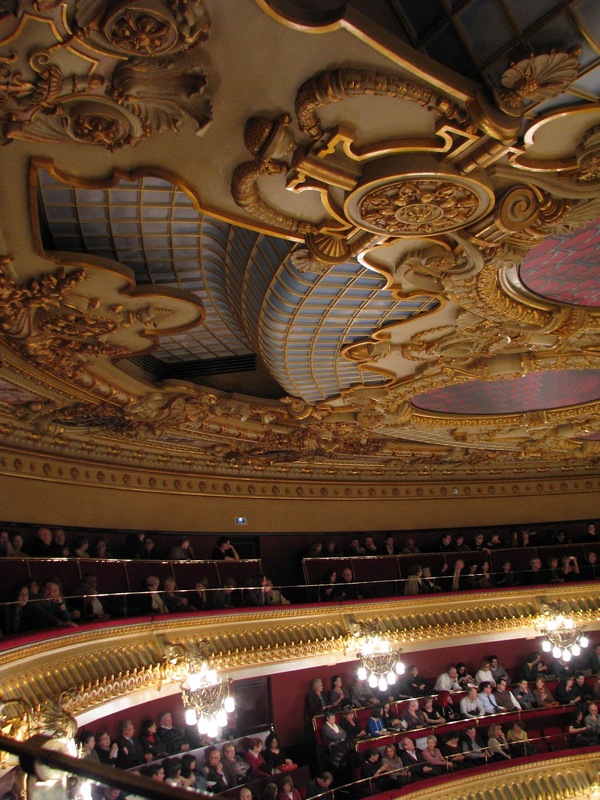 Gran Teatre del Liceu was built in 1894, but like all famous opera houses in Europe (that I've come across), it has a history of fire. But a recent one. 1994. It was fully restored and running by 1999 as one of the most techologicaly-advanced opera houses in the world. It reminded me of the opening scene of Edith Wharton's The Age of Innocence, what it must have been like in the 19th century with only the richest attending, more interested in seeing who is who and what gown they are wearing, than the actual performance. Perhaps that's still true, but up in the 5th balcony having purchased tickets whose cost only involved two digits, we were certainly not a part of that social scene. We saw a little of the theatre's techno-saviness as we noticed giant circles on the ceiling turn and open as each curtain rose. For lighting or fresh air? We weren't sure. But the circles were big, and it was an impressive turn. We were so high up! 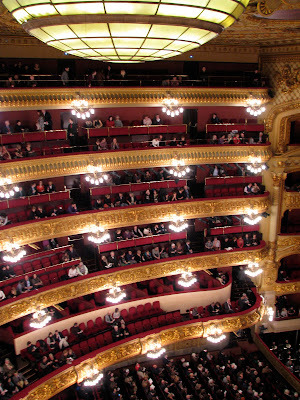 Liceu is supposed to be one of the larger opera houses in Europe, but it certainly can't be because of its width. It was so tall and skinny. Dizzying to look down! Here we are in the nosebleed section. We had to lean forward and rest on the ledge in order to see the action below. Some folks near us even used binoculars. Notice the Catalan subtitles on the screen above the stage. 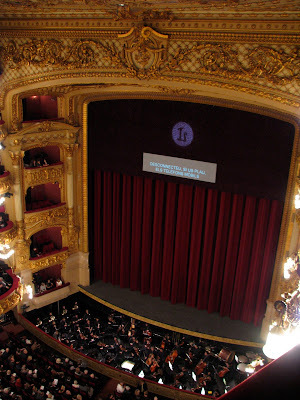 Maybe one day I will see an opera in my own country and be able to understand the subtitles.